(Compiled from reports at CNN, Politico and Bloomberg News) — President Donald Trump appeared to suggest Friday that he will announce some kind of border wall action during Tuesday’s State of the Union address, which he will deliver at 9 p.m. EST. The president is also expected to urge Congress to compromise on issues including immigration and infrastructure in his Febuary 5 address, as he asks Democrats to focus on working with him on legislation. The theme of his speech will be “choosing greatness,” a White House official told reporters. Trump’s speech “will focus on the bipartisan achievements we’ve already had, and look toward things that should be areas where we can work together” with Democrats, a White House official said. Later Friday, a senior White House official explained the topics that President Trump will cover, including: the economy, illegal immigration, trade deals — including the US-Mexico-Canada Agreement and the US Reciprocal Trade Agreement Act and the deal with China — infrastructure, lowering the cost of health care and prescription drugs, and national security. Compiled from reports at CNN, Politico and Bloomberg News published on February 1. Reprinted here for educational purposes only. NOTE to students: Read the information under “Background” below before answering the questions. 1. a) What is the State of the Union address? What is the purpose of the address? 2. What will be the theme of President Trump’s State of the Union address on Tuesday night? 3. How will the president’s speech focus on unity? 4. List the 6 major areas President Trump will cover in his address. 5. What action did President Trump suggest he will discuss during his State of the Union address? 6. President Trump’s address will focus on domestic and national security issues. Which of the following do you think are most important for President Trump to include in his State of the Union address? Explain your answer. 7. Ask a parent what issues he/she thinks President Trump should focus on in his State of the Union, and to explain his/her answer. Read the text of the President’s address at WhiteHouse.gov. 1. Tone is the attitude a speaker takes towards a subject. What was the tone of President Trump’s 2019 State of the Union address? 3. a) What general statement did President Trump make about the economy in his address to the nation? b) What is your reaction to this encouraging statement? 4. List some of the things the President promised to do to improve the economy. 5. What new initiatives did President Trump propose in his State of the Union? 6. Which issues did the President bypass altogether, or just mention briefly? 7. What issue presented by President Trump was the most important to you? Did any aspect of the speech disappoint you? Explain your answers. 8. a) Do you think the President is focusing on the correct issues? Explain your answer. 10. Watch/read the Democratic response to the President’s State of the Union on live TV following the President’s SOTU or at c-span.org. The response speech is shorter and often given as a rebuttal to the opposition party’s ideas and plans. This practice began once television became a major part of politics. According to the Senate’s website, the first opposition party response to a State of the Union speech was in 1966 when then-Senate Majority Leader Everett Dirksen (R-Illinois) and House Minority Leader Gerald Ford (R-Michigan) gave a response to President Lyndon Johnson’s State of the Union address. Stacey Abrams, who served in the Georgia state assembly for 10 years before becoming Georgia’s 2018 Democratic gubernatorial candidate gave the response. What do you think of Ms. Abrams’ response? The annual State of the Union Address is a time for a president to lay out his agenda for the nation. To read pro-Trump and anti-Trump perspectives, go to a website that links to op-eds from both perspectives: RealClearPolitics. Conservatives generally support the President’s policies. Although in President Trump’s case, several traditional consevative websites like National Review have been opposed to him personally as well as his policies on several important issues. Fox News is known as the “conservative” news station. However, Shep Smith, John Roberts and Bill Hemmer appear to hold him in disdain. They ususally oppose/question any policy Trump attempts to implement. For a conservative perspective of President Trump’s speech, read a commentary by Michael Goodwin or Mark Steyn or listen to conservative radio talkshow hosts Rush Limbaugh or Mark Simone. It is customary for the opposing party to respond to a President’s State of the Union address. Democratic Stacey Abrams of Georgia will give the Democratic response to President Trump’s State of the Union Address. Watch Ms. Abrams’ response at c-span.org. 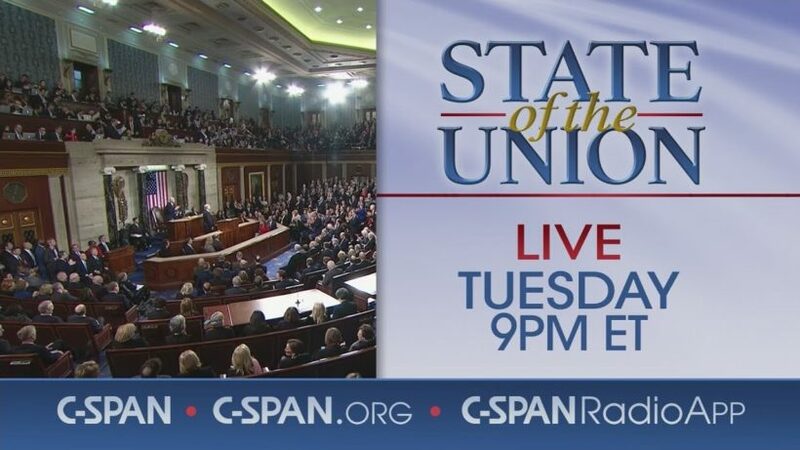 For texts and/or videos of Presidential State of the Union Addresses since 1945, go to c-span.org/SOTU. Who were President Trump’s special guests for the State of the Union? Read about each guest here.